With Apple TV, hoopla users are able to browse, search, borrow, and stream audiobooks, movies, music, and television. Additional features include closed captions and access to favorites to revisit saved content. The hoopla app is available on 4th and 5th generation devices. hoopla is now even more accessible with support for popular streaming devices! For a detailed FAQ on each of the devices, including downloading and syncing information, click here. With Android TV, hoopla users are able to browse, search, borrow, and stream movies and television. Easily toggle on Kids Mode to filter content for ages 13 and under. Additional features include closed captions and access to favorites to revisit saved content. With Roku, hoopla users are now able to browse, borrow, and stream movies and television. Additional features include closed captions. Soon, your patrons will be able to search, borrow, and play audiobooks and music albums on their Amazon devices, including Echo, Dot, Spot, and Show! 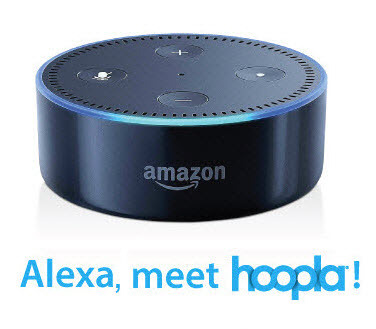 Watch our video here to see Alexa and hoopla in action! to the1st and 2nd generation Chromecasts, including Chromecast Ultra and Smart TVs with Chromecast built-in.